Throughout its 111-year history, the school gained a reputation for abuse, beatings, rapes, torture, and even murder of students by staff. Despite periodic investigations, changes of leadership, and promises to improve, the allegations of cruelty and abuse continued. Many of the allegations were confirmed by separate investigations by the Florida Department of Law Enforcement in 2010 and the Civil Rights Division of the United States Department of Justice in 2011.State authorities closed the school permanently in June 2011. 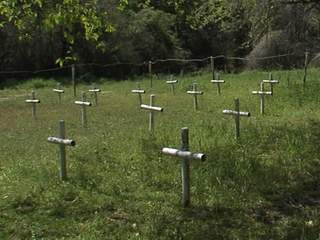 After decades of questions and allegations about boys buried on the grounds of the state’s first, oldest, and now abandoned reform school on the outskirts of the Panhandle town of Marianna, a team of forensics experts will finally exhume all of the bodies. The University of South Florida may soon be able to use science to answer allegations that the boys were not returned to their families after they died. The fear is they were not returned because there would have been signs of death by beating. Florida Gov. Rick Scott and the Florida Cabinet had previously blocked the University of Florida from exhuming the bodies. Pressure from grieving parents and State Attorney General Pam Bondi, who filed a petition to try and convince Rick Scott to allow the bodies to be examined, paid off. The permit was finally granted today and now families can maybe find answers they have been looking for. There could be more than 100 burials in and around a clandestine graveyard surrounded by thick pines. The true number is not yet known however the unmarked graves tell a gruesome story. This could potentially turn out to be a part of Florida history. A Part of history that Florida does not need nor want. The skeletal remains of the boys will hopefully be used to identify each and every boy that was buried, maybe even answer questions as to whether or not they were beaten to death while they were imprisoned at the school. There is no question about the abuse that went on in the school however the extent of the abuse has never really been known. For many families, the answers cannot come fast enough.